If you’re headed to Southern California with little kids, we know you’ll have some big goals for your visit. Maybe you’ll head to Disneyland, or the San Diego Zoo. But you might not have visiting Pretend City in Irvine on your list- and we think that’s a BIG omission. Our kids are borderline OBSESSED with the place, and we’ve been there enough times to collect some Pretend City tips you should know before you go. 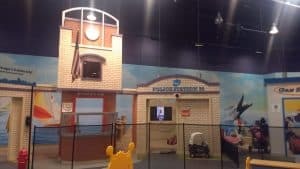 Pretend City children’s museum is exactly what it sounds like- it is a big, warehouse style building set up like a complete, working city. Kids are free to explore the city in any way they choose, and everything is designed to be touched and handled by inquisitive little hands. Kids can shop at a grocery store that looks exactly like Trader Joes, then head to the farm area to see how food is made and see baby chicks. They can dance on a stage, visit the library, or play at the beach. They can paint, splash in water tables, and build. They can visit the doctor or the dentist, work or “eat” in a restaurant, and play house in a tiny home made just for them. In a word- Pretend City is a child’s DREAM playground. 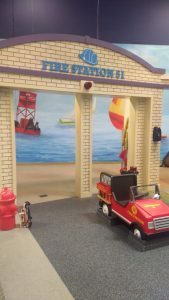 We love visiting Pretend City with toddlers, and even our big kids are still super into the pretend play this children’s museum provide. 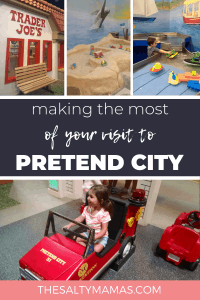 If you’re in the area- heck, even if you’re not- planning a visit to Pretend City could very well be one of the highlights of your trip. But before you go- here are our best Pretend City tips to make sure you get the most out of your visit. Before you go, you’ll need to know the Pretend City hours by checking the website. Take a peek at the calendar too, as Pretend City has lots of special events throughout the year, as well as early closures on Mondays. Pretend City is best for kids in the 2-8 year old range. Older and younger kids will still enjoy it, but it is targeted kids aged toddler through early elementary. 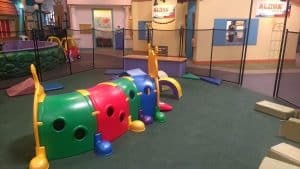 The more your kids enjoy pretend play, the more they’ll love Pretend City children’s museum. How much does Pretend City Cost? 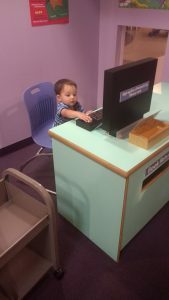 At the time of this post, Pretend City admission is $13.75 per person for anyone over the age of 12 months- including adults. Check to see if the price has changed here. How Can I Save Money at Pretend City? Pretend City is pretty pricey, in my humble opinion, but oh.so.worth it. But how can you save money at Pretend City? We’ve got a few expert tips to help. First, there are occasional deals listed on LocalFlavor.com. Check there first, as this is likely to be your best deal. Also, if you live in Orange County, you can receive free tickets to Pretend City by completing their ASQ developmental screening online. There can be a couple weeks of lag time between the screening and when the tickets get emailed out, however, so make sure you complete the survey in advance of your visit. But the best way to save money at Pretend City is by taking advantage of their Way to Play Day, held on the second Friday of each month. From opening until 3 pm, you can get Buy One, Get One Admission to Pretend City. It’s a bit busier than other days, but it cuts the cost in half, so it’s always felt worth it to me. There are also additional activities and developmental screenings this day-sometimes even resulting in a free return ticket. When is the Best Time to Visit Pretend City? Pretend City is always pretty hopping. In the mornings, you’ll get the younger kids, as well as field trip groups. On the weekend, you’ll get a bit more of a crowd, but nothing intolerable. But the best time to visit Pretend City is right at the start of Universal Little Kid Naptime, around 1 pm. The place is actively slow from about 1 pm to 3:30 pm, when those with annual passes show up to kill a little time before dinner. Even then, the afternoon crowds are much more manageable than the morning crowds. Can You Bring Food Into Pretend City? Good news- you can bring your own food into Pretend City! Pretend City does require all food to be peanut-free for the safety of their guests, but otherwise, you can bring in all the snacks, drinks, and food your kids’ hungry tummies desire. 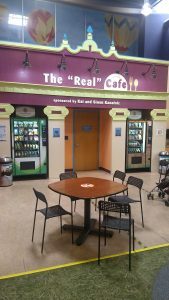 Snacks must be eaten in “The Real Café.” There are free lockers at the front of the museum where you can store your food until you’re ready to eat it (there are no locks, so don’t plan to store anything valuable). I would recommend packing at least one snack and a meal when planning a Pretend City visit. They’ll likely get hungry before they’re ready to settle down for a real meal, and bringing out lunch too early will probably result in you wasting it. What Should I Bring to Pretend City? As mentioned above, you can bring snacks, meals, and drinks. You’ll want to bring diapers for your littles, of course, as well as age appropriate snacks. 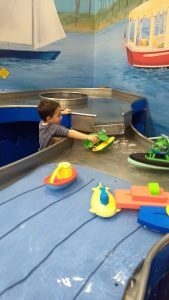 Pretend City has some messy play stations- a sail boat water play area, a beach with sand, an art studio- so you might want to consider packing a change of clothes. You can stash them in the lockers or leave them in your car, but it’s better to have them just in case your kid gets soaked or super messy. If you’ve got two kids, you might also want to bring a baby or toddler carrier. 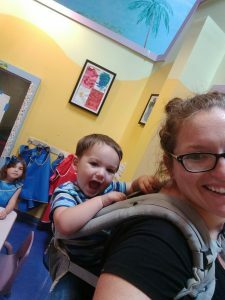 We’re partial to our Ergo, which has held kids from Baby Abram to five year old Lila when needed (and it’s pretty flexible, so it can go from front carrying to piggy-back style in a hot second). Having this on hand will help if someone needs to take a nap, or, frankly, if you get tired of chasing two kids around. And, as with most kids’ indoor play places, I like to ditch my big purse in favor of my cross body bag. I slip in some cash, a snack or two, and a diaper for my potty training guy. It makes it much easier to get in on the play than if you’re traveling with a large purse of diaper bag. Pretend City has you covered on bathrooms. Head through the art studio for a large bathroom with multiple stalls (perfect for Pretend City field trips or those coming with a group). There are even adorable tiny toilets there for kids who are potty training. In the back, near The Real Café, you’ll find family bathrooms. Each one has a changing table, toilet, and sink so your whole family can use the restroom, clean up, and get back to playing quickly. What Should I Do If I Need a Break? There are a couple of options if you get to Pretend City and start to feel a little overwhelmed. First, you can head to an area with only one entrance or exit, and set up shop near the door. Tell your kids they need to stay in that space, and give yourself a minute to breathe. The library, the Doctor’s office, and the play house are all good areas to visit when you’re worn out from keeping track of your kiddos. 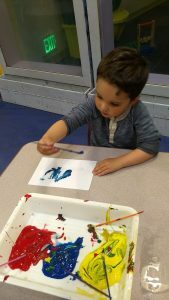 The art studio is also a quieter place for your kids to relax. If they are feeling overwhelmed, take them there to explore the various process art activities at their own pace. If that doesn’t work, you can toss your smaller kid in the Ergo for a minute and take a deep breath. Remind yourself that the museum exit is monitored, and that everything is going to be okay. Does Pretend City have an In-And-Out Policy? If the other break options aren’t working for you, you’ll be relieved to find that Pretend City has an in-and-out policy. If you need to, you can head to your car for a snack break (like I did on my last visit) or even head back to your house or hotel for a bit. Just make sure to check in with the front desk before leaving- there are currently no hand stamps or anything to show that you’ve been inside already, and you want to make sure they remember you. Does Pretend City have WiFi? Noooope. There is actually a No Cell Phones policy at Pretend City. You can snap a few pics, but they want you to keep your eyes and attention on your kiddo at all times. And besides, Pretend City is way more fun if you, ya know…pretend. If you’re planning a visit to Pretend City, these Pretend City tips will be sure to make your visit just a little sweeter. And your kids? Well, they’re just gonna LOVE it. Been there? Drop your kids’ favorite area in the comments!